Overview - A 19th century French aristocrat, notorious for his scathing memoirs about life in Russia, travels through the Russian State Hermitage Museum and encounters historical figures from the last 200+ years. "Everyone can see the future, but no one remembers the past." The long, extended take has become a staple of cinematic style. From pioneering masters like Jean Renoir, Max Ophuls, and Alfred Hitchcock, to contemporary artists such as Martin Scorsese and Alfonso Cuaron, many different directors have put their own unique stamp on the technique, using uninterrupted shots with free flowing, reframing camera movements to enhance their films. By sustaining their images without cuts, these filmmakers are able to prolong tension and maintain a sense of real time on screen, while simultaneously drawing connections and implying meaning through their tracks and pans. Over the years, directors have even tried to one-up themselves, pushing the technical limits for how long a single shot can be preserved. This brings us to Alexander Sokurov's 2002 historical drama, 'Russian Ark,' a film which has the rare distinction of being one of the very few feature length movies to be entirely made of a single, unbroken steadicam shot. A fantastical and gorgeous celebration of art and culture, the movie proves to be more than just a stylistic gimmick, offering a unique and seamless experience that guides viewers through 300 hundred years of Russian history. Filmed entirely at the Hermitage museum in St. Petersburg, Russia, the movie's very loose story focuses on an anonymous narrator who finds himself drifting through time. As he segues from room to room throughout the massive structure, he often transitions from era to era, running into various Russian historical figures from several different time periods. Early on, he comes across another man, a European (Sergey Dreyden), who also seems to be drifting just like him. The stranger serves as his occasional guide, and the two debate the merits of Russian culture as they see it all for themselves first hand. On the surface, the thin narrative is really nothing more than an excuse to justify the film's setting while throwing as much Russian history at the screen as possible -- but honestly, that isn't necessarily a bad thing. Conventional storytelling isn't really the goal here, and instead the movie takes on a more visceral, dreamy, and at times, almost documentary feel. With that said, I actually found the script's little hints of fantasy and vague mythological notions to be quite intriguing, and the tiny morsels and bits of detail that we get about our enigmatic protagonists are rather interesting. Sometimes they are ignored by those around them. Other times they are greeted as guests, and in a few situations they are even treated like hostile intruders. Are they time travelers? Disembodied ghosts? Two dreamers sharing a vision? The movie is never quite clear, but this mystery helps to give the film a certain ethereal quality, and despite their comparatively underdeveloped characterizations, the two leads remain oddly compelling. Of course, the real star here isn't our narrator or even his ambiguous guide -- it's the Hermitage itself. To this end, director Alexander Sokurov wisely places due emphasis on the inherent beauty of his astonishing location. Likewise, he also focuses on the film's incredible production designs and all of the elaborate period appropriate costumes that adorn his massive cast of extras. As we transition from room to room and gallery to gallery, we are treated to a never ending visual feast of paintings, sculptures, breathtaking architecture, and hundreds of wandering background characters. All the while, the narrator and his companion provide little bits of history and lore related to the sights and sounds before us, cluing us in on three centuries of Russian art, culture, and history. With that said, these observations aren't always as interesting or as developed as they could be, and those unfamiliar with the basics of Russian history might be a little lost from time to time. Still, the sheer scope of the production is really quite mesmerizing, and the mammoth undertaking certainly pays off. Even ignoring the incredible logistical feat of coordinating and choreographing such an ambitious and complicated 90 minute shot, the director manages to create an engaging and rather singular journey. While some might be quick to assume that the single shot style is little more than a gimmick, the chosen aesthetic actually ends up complementing Sokurov's intentions perfectly, offering a unique kind of first person voyage. We see directly from the narrator's point of view, and this level of intimacy places us right in his shoes, allowing the audience to experience what he experiences as he experiences it without any kind of cutting or time shifts. At first I was almost overwhelmed by the constantly bustling world and found the lack of cuts to be potentially distracting, but eventually the unbroken steadicam movements become invisible, creating a seamless and wholly organic stream of imagery. There's always something going on, and we are continually left wondering where we will go next and what we will see, engendering a fanciful and wondrous sense of anticipation. From extravagant balls to lavish dinners and royal ceremonies, we are fully transported into the past in stunning detail. And based on the sheer beauty that it's tasked with capturing, it comes as no surprise that the camera would choose to never blink. After all, it wouldn't want to miss anything. 'Russian Ark' is a truly unique cinematic experience. More than just an experiment with form and technology, the film's single take construction becomes an essential piece of its success. A dreamlike and ethereal journey into the very ebb and flow of time, the movie offers a gorgeous tapestry of Russian history, and through his fantastical tour of the Hermitage museum, director Alexander Sokurov creates a fully living and breathing universe. Taken at face value, the story is quite thin, but there is a kind of mystery and intoxicating otherworldliness about the narrative that adds an extra layer of intrigue and wonder to the movie's examination of culture and art. An impressive technical and artistic achievement, the film manages to stand separate from its astonishing backstage production to become a genuinely compelling piece of visual cinema. 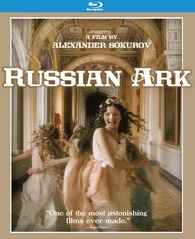 Kino brings 'Russian Ark' to Blu-ray on a Region A BD-50 disc housed in a keepcase. After some warnings and logos the screen transitions to a standard menu. The movie is provided with a 1080p/AVC MPEG-4 transfer in the 1.78:1 aspect ratio. Though the visuals and production design themselves are quite stunning, there are unfortunately a few technical anomalies that hold the transfer back. The digital source is decently rendered, but there are frequent instances where noise and false contouring become readily visible. Since the film was shot using early HD recording technology it's possible that these artifacts are simply inherent to the original digital shooting methods, but regardless, they do detract from the overall picture quality. Thankfully, detail is mostly pleasing, providing a good amount of fine textures among all of the museum's extravagant rooms and galleries. However, compared to contemporary digital features, the image can be on the soft side. The color palette changes from warm to cool depending on the tone of the sequence, but there are some vivid splashes of bold hues with decent pop when called for. Dimension is also solid and contrast is balanced well. With that said, black levels are not always consistent and shadows often appear faded. 'Russian Ark' is undoubtedly a beautiful film, but there are some noticeable artifacts and digital anomalies present throughout the transfer that give the picture an occasionally low grade appearance. Still, it's likely that these issues are simply a result of the early digital production equipment used. The film is presented with a Russian LPCM 2.0 track along with English subtitles. Though only two channels, this is a surprisingly engrossing mix that helps to extend the film's world through enveloping sound design. Dialogue and narration are clear and well prioritized throughout. With that said, all of the movie's sound appears to have been added in post and speech does not always sync properly with the actors' mouths. The soundscape is wide and spacious for a two channel presentation, spreading effects and music nicely with great stereo separation. Wind, birds, footsteps, and background chatter all help to create an immersive ambiance and the film's quieter, introspective moments are given an appropriately delicate and subtle atmosphere. The movie is also home to a lovely score and great classical music selections and the climactic ballroom scene is simply a feast for the ears. Bass activity is pretty negligible, however, but there really is no call for aggressive low frequencies. Crisp and effectively immersive, the two channel sound design does a lot with very little. Separation and directionality are strong, helping to breathe further life into Sokurov's universe. In One Breath (HD, 44 min) – Presented in upscaled 1080i with LPCM 2.0 sound and hardcoded English subs for the foreign language portions, this is a comprehensive behind-the-scenes featurette that chronicles the film's highly ambitious one day shooting schedule. We get lots of on-set footage of the crew dressing and lighting the location and clips of the massive cast of extras preparing for their roles. We also get to see snippets of the director's three failed attempts before the final fourth take was successfully completed. Interviews with the cast and crew are also provided, highlighting more difficulties from the shoot and information about the museum and Russian history. Trailer (SD, 2 min) – The film's trailer is included in 1080i with LPCM 2.0 sound. 'Russian Ark' is a truly unique piece of cinema. More than just a gimmick, the film's one shot construction becomes an artistically potent part of its success, helping to create a fantastical and extravagant celebration of art, history, and culture. The video transfer is solid but prone to occasional artifacts. Thankfully, despite only being a 2.0 mix, the audio is quite strong. We only get one supplement, but the included documentary provides lots of cool information about the movie's unique shoot. Despite its intentionally loose narrative, the film offers viewers a dreamlike journey through Russian history -- one that remains an impressive piece of technical and artistic filmmaking. Recommended.